There is “a time to be born and a time to die . . .” Each day, the body’s cells—particularly, the skin and blood cells, are being produced anew. Since their total number must be kept constant, a mechanism must be in place to maintain a balance and remove any redundant cells. This mechanism, programmed cell death (PCD), is an orderly, highly regulated process that functions to keep normal cell division (mitosis) in check. There are other conditions in which removal of cells—such as those that are old, diseased, or damaged from exposure to toxic materials or radiation—benefits the organism. During menstruation, the body sheds the lining of the uterus. By contrast, inadequate PCD can lead to the spread of cancer or, for instance, babies born with fingers still joined. Responding to signals arising from outside and within the cell to initiate PCD, the cell undergoes a reduction in size as its components break down and condense. These cell fragments (apoptotic bodies) become enclosed in a membrane, walling them off and preventing them from damaging nearby cells. Phagocytic cells then engulf and destroy the fragments. Carl Vogt, a German biologist working in Switzerland, was first to describe the concept of PCD in 1842 while studying the development of tadpoles. In 1885, Walther Flemming, another biologist, described this phenomenon in more precise detail; Flemming’s fame rests on his discovery of mitosis and chromosomes, one of the most significant discoveries in cell biology and in all of science. Interest in PCD was revived in 1965, when the Australian pathologist John Foxton Ross Kerr first described the ultramicroscopic characteristics of PCD and how it was a normal process that differed from necrosis caused by tissue injury. It was Kerr who was first to refer to PCD as apoptosis, from the Greek “falling off,” as petals or leaves. During the 1970s, John E. Sulston, H. Robert Horvitz, and Sydney Brenner, working at Cambridge University and studying the genetic sequence of roundworms, gained an understanding of apoptosis at a molecular level; the three were co-recipients of the 2002 Nobel Prize. SEE ALSO: Blood Cells (1658), Cell Theory (1838), Homeostasis (1854), Mitosis (1882), Cell Cycle Checkpoints (1970). Apoptosis is a normal body process intended to remove redundant cells. 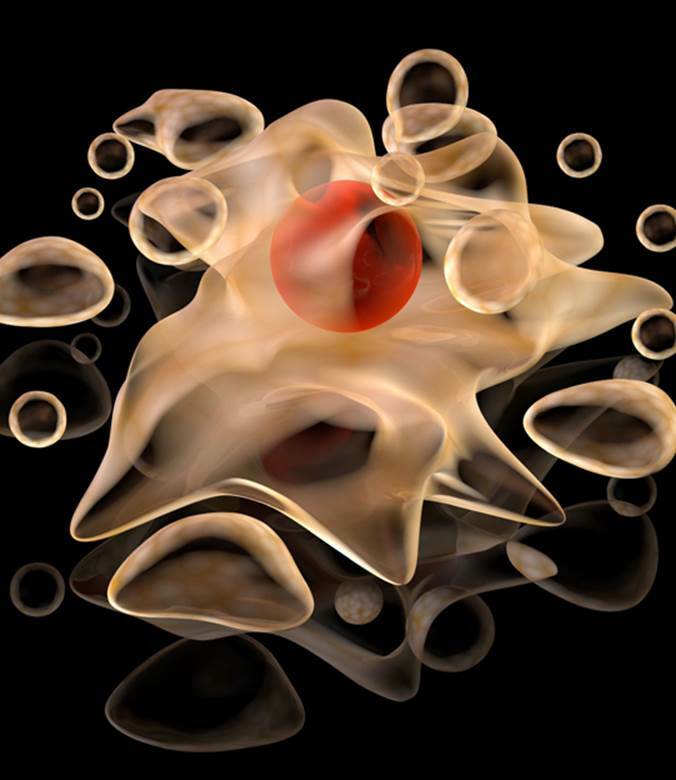 This three-dimensional illustration shows an apoptotic cell that will be discarded from the body because it is old, diseased, or damaged.